"Another Bierkeller? I don't mind if I do..." OK, this is absolutely the final post from our trip to Oberfranken, and while it unfortunately won't be quite as long as Boak & Bailey wanted for their "Go long" day, I hope it will at least be a thoughtful one. It's Saturday morning and we're in the car on the way to Forchheim for the Annafest. On the way we pass several signs pointing to various country beer-gardens, or Bierkellers as they are known hereabouts for reasons previously mentioned. It's a blazing sunny day and beer is definitely in order but we ignore the signs because we already have a destination for lunch: Roppelt's Keller. It's already pretty busy when we finally wind our way down the dusty track and argue over which side of the car park might actually get some shade soon (answer - the one that's already fully occupied...) but there are still some tables free at the back towards the playground. A climbing frame: that's one small boy happy, anyhow. Once we get our bearings it doesn't take long to en-happy the rest of us too, thanks to half-litre ceramic krugs of Kellerbier for about €2 each - no wonder paying €7.40 a litre at Annafest came as a shock later. The seating area is substantial, partly shaded by trees and partly by roll-out shades, then there are assorted buildings around. One houses the bar counter plus a second counter for cakes and stuff, and another houses the kitchen and hot food counter. There's also a large drinking room around the back, presumably for use in bad weather. It's all self-service as usual with Franconian Kellers. Kellerbier and large chunks of braised pork, sat in the shade on a sunny day and with the option of a post-prandial stroll in the woods - what more could you want? 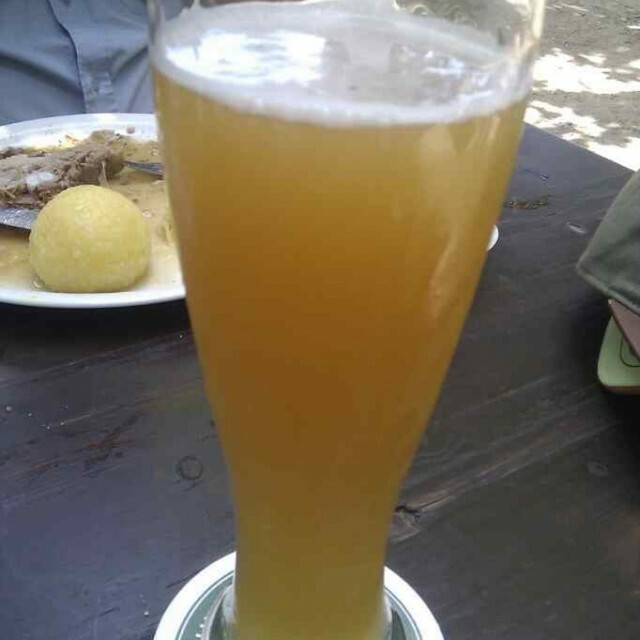 OK, I had to try the Weissbier too and that was only so-so, but still it was a wrench to have to leave as check-in time for our hotel approached. Then on Sunday, Annafest was lovely to start with, but with the noise and bustle - and the requirement to drink everything in litres - it began to pall. There were still several hours of light left though so again we got into the car and drove into the countryside, headed this time for the Witzgall Keller. It's not so easy to see - there's a sign by the side of a fairly quiet country road, then a field with a few cars parked in it. From here we could make out a house of some sort in the woods and hear voices, so we walked into the woods and there it was - a low building surrounded on three sides by tables and trees. It’s green and leafy, and although there was occasional traffic on the road, it wasn't intrusive. This time there's only the one beer on offer - a lovely hoppy, lightly earthy and bitter Landbier - and the bar is inside, where the living room would be if this was a house. The food counter is outside, fronting the small terrace. For the kids there’s a sandpit and some old stones to climb on, plus of course the woods to ramble in. Again, we find ourselves in no particular hurry to move on, and it's only dusk and the boy's impending bedtime that levers us away from our krugs. On the way back to the car, we spot what appears to be the cellar door at one end of the building - by the look of it, it's built directly over the entrance to the actual Keller. Just recently I found myself thinking back to these two Bierkellers and the others we'd visited a few days earlier, and I realised it wasn't the first time I'd had Franconian Kellerbier. In the past though it hadn't really grabbed me, where as on this trip it had been great. The difference of course was that the previous examples had been bottled, and sampled some considerable distance from their source. So it struck me: was it simply the drinking environment? For surely any beer will taste better in sunshine and in lovely verdant surroundings. Or was it the terroir, the "sense of place" and the unique qualities that agricultural products derive from the sum of the effects that their local environment - the geography, geology, climate, even the local human culture - has on their production? Could these beers ever be as good elsewhere, even in an equally sunny and green beer-garden somewhere else? I'm not sure that they could, to be honest. 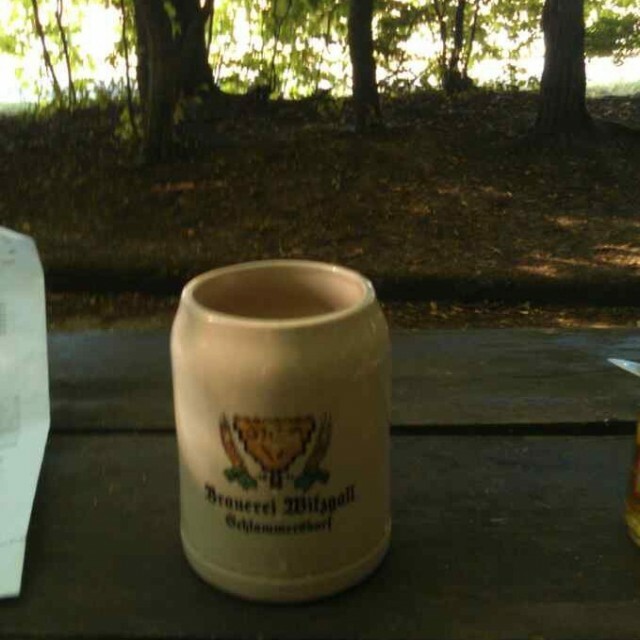 You can take the bier out of the keller, but can you take the keller out of the bier? As a postscript, raising this topic on Twitter and Facebook produced some interesting feedback, and it looks to me as if there are at least three factors at work here. 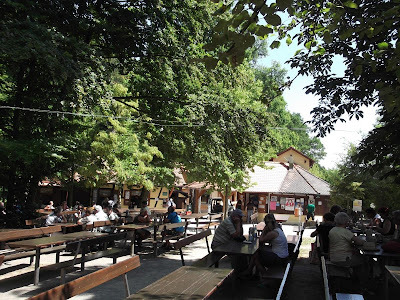 As well as the terroir, there is what Germans call the "Freibad fritten" effect - the fact that quite ordinary stuff tastes better in the right environment and circumstances (chips after a refreshing swim at an open-air pool, in the case of Freibad fritten). But there's a third factor too, which is that these beers - like the Lithuanian ones that Lars Garshol writes about on his blog - are typically unfiltered and unpasteurised, and often ungespundet too (this approximately translates to having an unpressurised secondary fermentation in cask, a bit like British real ales). That means they'll have a shorter shelf life, they won't travel as well, and yes, they really are going to be freshest and best at the source. I've experienced this effect that you describe many times, and there's no doubt that the reason people say "beer doesn't travel" is a combination of enjoying the place where you have the beer, and deterioration of the beer during transport away from the source. Disentangling those two can be very difficult, exactly as you say. But I don't think terroir has anything to do with it. Terroir is basically the way the place of origin flavours the product, so that German beer winds up tasting different from Belgian beers. This has nothing to do with where you drink them. Belgian beer has terroir, ie it tastes like only beer from Belgium can, whether you drink it in Tokyo or Seattle. I think I see what you mean - that you prioritise the closeness of production over the localness of the ingredients. The combination of setting, occasion and company can all have a powerful effect on ones appreciation (or otherwise) of the beer. I've experienced this many times myself, in many different settings, and I think this is something beer lovers often overlook. A classic English bitter, enjoyed in an unspoilt traditional pub, in the company of friends; a glass of warming strong ale, enjoyed in front of a roaring log fire, after a hike across the moors, in winter, to a country pub or, as both you and I have both experienced recently, a cool, stoneware Krug of Franconian Kellerbier, enjoyed under the shady trees in a rural Keller, all take some beating. Drink any of these beers in a different context, and you can almost guarantee they will not be as good!